To help you better manage your debts, Quicken 2012 provides a neat Loan Calculator that computes loan payments and balances. Suppose that one afternoon, you’re wondering what the mortgage payment is on one of those monstrous houses: tens of thousands of square feet, acres of grounds, cottages for the domestic help, and so on. You get the picture — something that’s a really vulgar display of wealth. Click the Planning tab. Click the Planning Tools button to display Quicken’s list of financial calculator tools. Then choose the Loan Calculator. Quicken displays the Loan Calculator dialog box. Move the cursor to the Annual Interest Rate text box and type the interest rate percent. If a loan charges 5 percent interest, for example, type 5. Enter the number of years you want to take to repay the loan. Move the cursor to the Number Of Years text box and type the number of years you plan to make payments. Indicate how many loan payments you plan to make per year. Move the cursor to the Periods Per Year text box and type the number of loan payments you plan to make per year. If you want to make monthly payments, for example, type 12. Indicate how frequently the lender will calculate, or compound, interest. If you click Calculate or move the selection cursor, Quicken calculates the loan payment and displays the amount in the Payment field. Hey, wait. $26,841.08. To get more information on the loan payments, interest and principal portions of payments, and outstanding loan balances, click the View Schedule button, which appears on the face of the Loan Calculator dialog box. Quicken whips up a quick loan amortization schedule showing all this stuff. 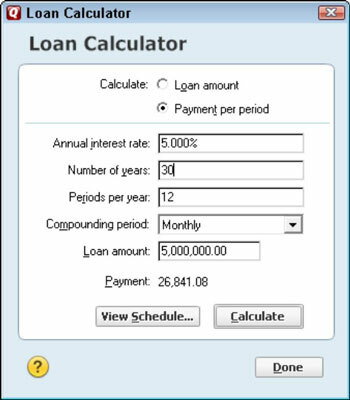 To calculate the loan principal amount, select the Loan Amount option button under Calculate in the Loan Calculator dialog box. Then enter all the other variables. Select the Loan Amount option button. Type 4.25 in the Annual Interest Rate text box. Type 30 in the Number Of Years text box. Type 12 in the Periods Per Year text box. Type 2000 in the Payment Per Period text box. 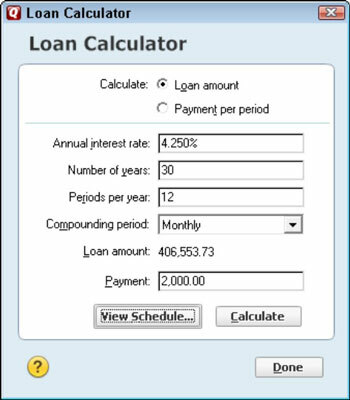 After you click the Calculator button or move the selection cursor, the Loan Calculator computes a loan amount of $406,553.73.